RNA oligos are susceptible to degradation to the same extent as native RNA extracted from various sources. An attractive alternate to prevent degradation from nucleases is the use of 2�-O- methyl RNA bases, when specific 2�OH is not required. The 2�-O- methyl oligonucleotides confer considerable nuclease resistance and are similar in hydrogen bonding properties to RNA/RNA than the lower RNA/DNA binding property (7). The coupling efficiency of 2�-O- methyl phosphoramidite is also higher than the RNA monomers resulting in higher yield of full-length oligos. Gene Link also offers custom synthesis of RNA and DNA chimeric oligos with investigator specified ribo or deoxy bases or 2'-O-methyl bases. The chimeric oligos can also be synthesized with the regular phosphodiester bonds or substituted with phosphorothioate linkages. The combination of 2�-O- methyl RNA bases with phosphorothioate internucleotide linkages imparts these oligos greater nuclease resistance, which is particularly useful for antisense studies. 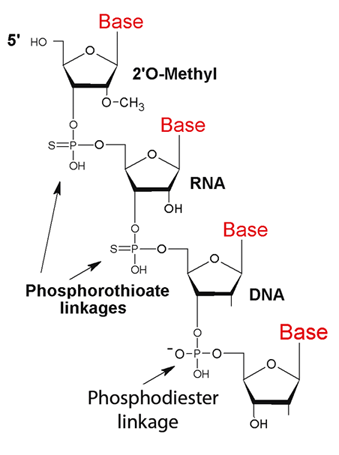 Custom phosphorothioate oligonucleotides synthesized by Gene Link can be specified to have all the diester bonds substituted or only some selected diester linkages depending upon the researchers experimental requirement. Substitution of all diester linkage is recommended to provide greater nuclease resistance.